DVD10 is part of the 2017 Super Treasure Hunt set and 4/5 in the Surf’s Up series. It is Spectraflame red with a black roof decorated by a brown double stripe and “TH”. 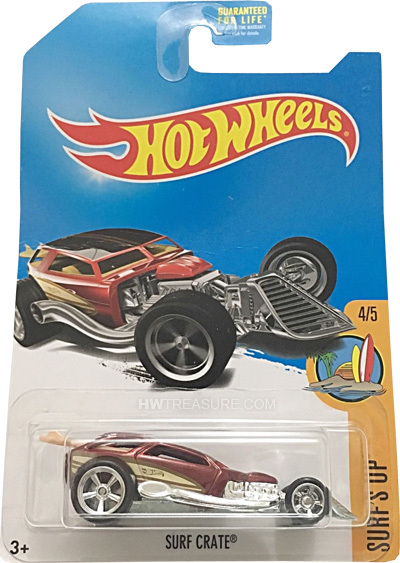 The sides have brown & silver graphics with the Hot Wheels logo. The car has a chrome engine, beige interior, Real Rider wheels, and an unpainted metal Malaysia base. 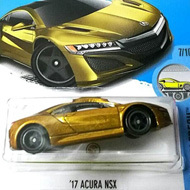 This vehicle can be found in mix “E” of 2017 Hot Wheels mainline cases. 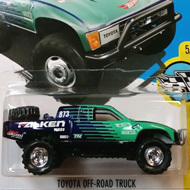 The Surf Crate made its debut in the 2000 First Editions series. It was previously a Treasure Hunt in 2012.